Four days after The Hindu board summarily decided to pause its ongoing “professionalisation” process, the Mount Road Mahavishnu has reverted to its previous design, as promised by chairman N. Ram in a tweet (below). On the left (top) is the October 21 issue, the last with Varadarajan at the helm, and on the right is the October 24 issue with editor-in-chief N. Ravi back in the editorial saddle. Very little of Deepak Harichandan‘s “chic new design” is left in the new “old” paper, which was designed by India’s favourite Spanish designer, Mario Garcia after Ram’s return as editor. The banner-panels are gone; the story slugs are gone; the “Short Takes” on the left have shifted to the right as “Briefly”; the font of the lead story is back to the past; the emblematic blue colour for story jumps gives way to beige, etc. Only the tagline “India’s National Newspaper since 1878” remains, although its colour too has changed from blue to red. Like all redesigns, Harichandan’s visualisation for The Hindu—a “pastiche‘ of The Times of India and The New Indian Express, where he had worked—had its fans and foes, amongst journalists within The Hindu and, more importantly, readers. 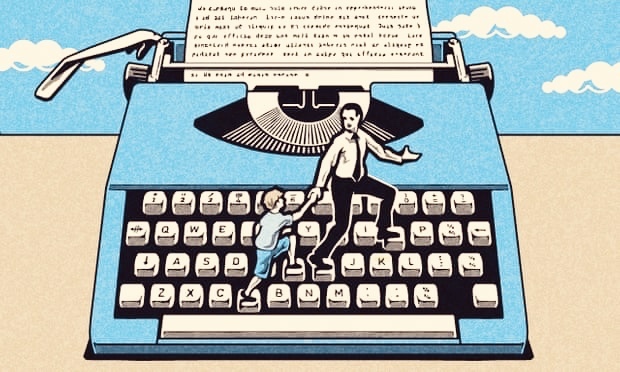 While the younger lot said it was the way to go if it had to catch up with the times, the “old school” squirmed at design taking precedence over text, while older readers complained of how difficult it was to navigate through the paper and virtually impossible to read the graphics. Wondering if these changes will extend to their online presence, http://www.thehindu.com/. I suspect for many people this too is the way they access the paper. Any newspaper design has a shelf life of a few years only . Mario’s Garcia’s design for THE HINDU has lasted for much longer period of 7-8 years . As a professional editor Siddarth introduced a new design to show it as his stamp and he did the right thing . It would have died a natural death – say after 2-3 years – but alas , N.Ram chose to kill it – not allowing the new design to run even for 6 months . If N.Ram had waited and introduced another new design in say 6 months , readers would have appreciated . It only shows the poor mentality of N.Ram – not allowing other editors to grab lime light. The Hindu caught the fancy of new readers all over India and its circulation is said to have gone up to 18 lakhs plus after the new design brought in by Siddharth . In any case Ravi and Malini who will go back to their own ways of sitting in ivory towers and delivering sermons in editorials of THE HINDU will cause doom only to THE HINDU . The claim that circulation of The Hindu has gone up during the reign of Siddharth is suspect. Anyway, circulation figures are not reliable. IRS figures are said to be more reliable. During 2004 Q 4 (latest figures available) readership of The Hindu has gone down 90000 according to IRS. TOI has managed to build up a good readership base, and took away sizable chunk of ads from The Hindu , in Kerala, within a year of its launch. The Opportunities supplement which used to be published as a 4-8 page pull-out has shrunk to 2 pages in the main section. The Sunday Magazine has shrunk to 4 pages from 6-8 pages. All these happened under Siddharth-Ananth’s watch. May be not because of their failings, but because of the aggressive marketing by TOI. But, Fernadaez, I do share your skepticism regarding The Hindu’s future. 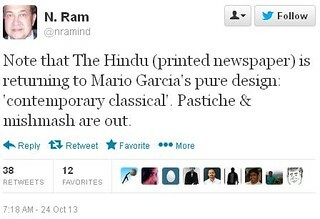 the hindu DOES NOT owe its existence to designs and fonts-whether Ram’s or Varadarajan’s. It’s for the contents-the news,the editorials and the features, although one strongly believes the news-reporting could be less unabashedly biased. 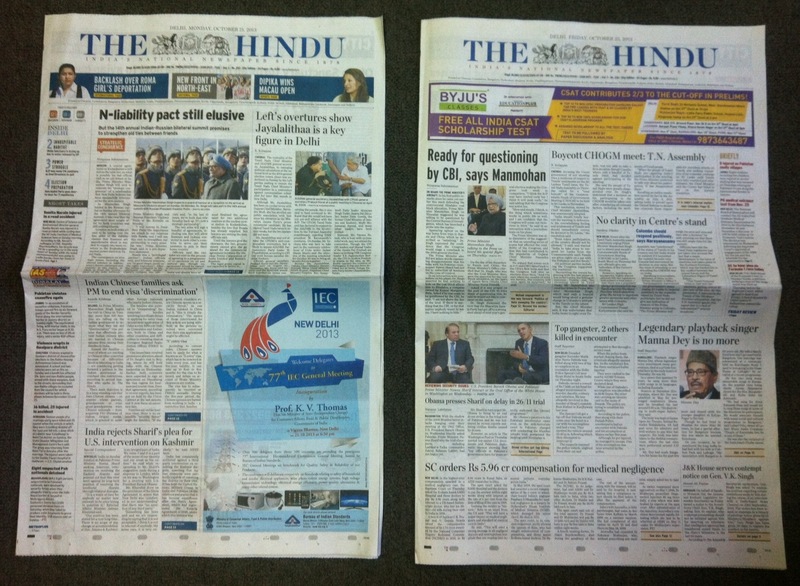 From the photos of THE HINDU layout – the brief earlier one introduced by Siddarth on the left and Mario’s design brought back by N.Ram in 2005 or so on the right – it is crystal clear how Siddarth’s re design is pleasing to the eye and far better . It only shows The Hindu management is ready to cut their face to spite the nose . Now, will the old ‘Airavath’ logo of the print edition replace SV’s ‘blue elephant’ (it should have been green) logo in facebook & twitter pages? with Ram still at the helm, the paper is likely to pursue its biased reporting. Just adjusting layout he and there hardly matters. The average reader does not bother too much about design elements. As long as he gets news and information, neatly packaged, he/she is happy. Style, design and colour serve a limited purpose. Design changes are basically meant to pander to the egos of art directors and ‘learned’ editors! Following on the return to the old design maybe we will see editorials and lead articles in Peoples Democracy appear as curtain-raisers in the paper like it used to be. And dreary reports from the man who makes a living writing about the poverty of the poor in one of the world’s poorest countries. The real reason, I suspect ,behind SV’s ouster was his unwillingness to pander to Ram’s political bias. If the new editor-in-chief is worth his salt he should live up to the things he said in his letter setting out the reasons for his resignation. It is the content which makes a newspaper, and not design. Beautiful women don’t need make-up to look beautiful. abnormal with the newspaper’s design and layout during the brief tenure of Siddharth Varadarajan as Editor. In fact, he introduced new features and brought in many hitherto unknown contributors to write for the paper, rather than stick to stale, pompous writers [I don’t want to name them]. Some of the members of the Kasturi family want some excuse or the other to justify their sacking of Siddharth and the erstwhile CEO. It’s back to square one, more or less!